When spring hits the Oklahoma city area, homeowners and commercial property owners alike can’t avoid thinking about the weather. Our region is often subject to strong thunderstorms, high winds, hail, and even tornadoes. And that means your home, office, or rental property may suffer some storm damage to its roof or exterior walls that normally offer protection against the elements. When water damage, storm damage, fire, vandalism, or other disasters occur on your property, you’ll need to act fast to protect it. This is a crucial step to ensuring you don’t incur further damage, complicating the property restoration process and keeping you from getting back to normal as quickly as you’d like to. Employing an emergency tarp or other temporary roofing overexposed areas of the roof and exterior walls can be an effective form of protection if done properly. Here are some tips to keep in mind as you set out to install tarps on the damaged property while repairs are being made. Many people hope to save on the costs of property restoration by doing some of the work themselves. And if you are someone who has professional training and skills in construction, it may make sense to do so. But most homeowners and commercial property owners are not experienced roofers. And roofs are a potentially dangerous place to work even in ideal conditions, much less when storm or water damage has left holes or weakened spots in the roof where someone could easily get hurt if they are not careful. Hiring experienced roofers or a property restoration company that is experienced in addressing roof damage is a smart move. How long can I use a roof tarp before having permanent repairs done? Once a roof tarp is properly installed, it’s tempting to take your time having the permanent restoration work completed. After all, it can seem as though the tarp will do its job for a long time. The reality, however, is that even the best roof tarp, installed perfectly, is only intended as a temporary fix. And as such, it won’t last forever. The longer you leave it in place without fixing the underlying issues, the more problems you are likely to have as time passes. Tarp can prevent further water from getting inside your home, but it can’t prevent mold from growing as a result of the moisture that penetrated your home during the initial disaster. And tarps can trap moisture too, leading to further mold growth and damage to previously intact shingles. In windy weather, the tarp can move, leaving spaces exposed to further water damage. Additional leaks can crop up as a result. A tarp isn’t the same as proper insulation. It may cause your home or business to retain too much heat or lose heat, leading to a higher utility bill. If the tarp is improperly installed, it can end up capturing small pools of standing water where mosquitoes and other annoying insects can breed. How quickly can I get a roof tarp installed? With a great property restoration company, the response time can be very fast. At TRILINK, we have teams available 24/7 so that in an emergency, we can respond swiftly to your need. We get onsite right away to remove trees and other debris, install tarps and other temporary barriers, and secure your home or commercial property so that further damage is minimized. What about my insurance claims? At TRILINK, we have years of experience in helping homeowners, business property owners, and property managers navigate the ins and outs of successful insurance claims. As you file your claim, we can assist you by providing documentation, offering straightforward guidance, and working in cooperation with claims adjusters. Call now—Get our skilled team onsite to swiftly stop the damage. Get informed—Receive a complete, accurate assessment of your property so you can focus on making an educated decision you feel confident with. Tag team on insurance—We’ll help you navigate the maze of insurance estimates and claims with straightforward, honest guidance. Get back to normal—Our smooth, no-nonsense approach will help turn your life right side up again in no time. We make our process straightforward and helpful, giving you a property restoration experience that is as stress-free as possible. 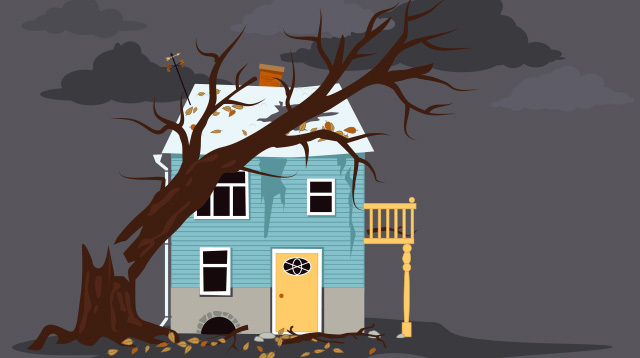 To learn more about our storm damage restoration services, or to create a commercial property or family/residential property emergency restoration plan in case disaster strikes in the future, contact us now—and put your mind at ease when it comes to the safety of your property.